Our collection of accent chair side tables is design with a unique style for any decors of your home, from traditional to contemporary. 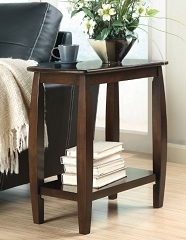 These accent tables is smaller than the End Tables and fit nicely with any accent chair or recliner in your living room or office. Assembly required for these table collections.